Koh Yao Noi island is found in Phang Nga Bay to the Northeast of Phuket, home to a Muslim population of maybe 4,000 people, with the main source of income being fishing, prawn and shell farms, and rubber. 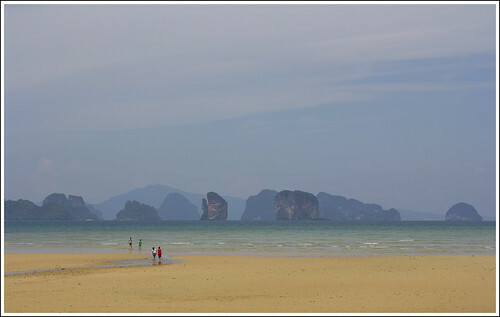 The large scale tourism of Phuket, Phi Phi and Krabi is not (yet) to be found on Koh Yao Noi. 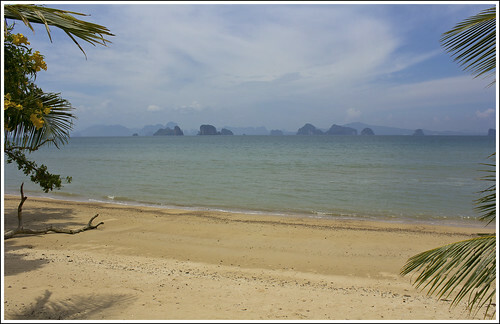 There are a couple of expensive resorts such as Paradise Koh Yao, and a number of smaller bungalow operations, but the island is still mostly rural. We first went in 2006 on a day trip, but I did not go again until doing a cycling tour in 2010. Then in April 2011 we did a family trip, getting the ferry over and hiring mopeds for the day. Was such a great day out that we decided to do it again! 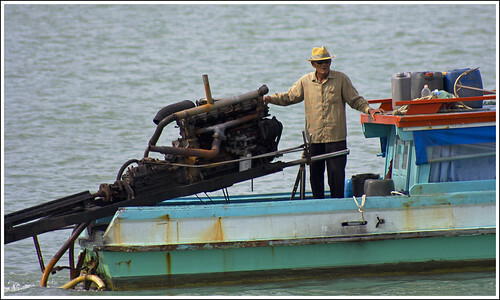 So on July 28th 2012, we drove up to Bang Rong (near Bang Pae Waterfall) to get the boat. Bang Rong is a Muslim village on the NE coast of Phuket, and from here boats depart to Koh Yao Noi and Koh Yao Yai. There are speedboats (200 Baht each way per person) or you can get a big longtail boat (see photos later) 120 Baht each way. When we arrived at the pier, the next boat was a speedboat. Kids - no charge, by the way. We had a wait of about 30 minutes before departure, there is some kind of boat going a couple of times per hour. The speedboat took just over 30 minutes, stopping off first at a small jetty on the north of Koh Yao Yai, the larger island to the south of Koh Yao Noi. Arriving at Koh Yao Noi, we asked around for mopeds for rent - we needed 3 altogether, 2 for us and 1 for a friend who'd come with her 2 kids. It may sound a bit cavalier or unsafe hiring mopeds and riding around with the kids, but Koh Yao Noi is so quiet, and there is very little traffic on the roads, and mostly we'd be pootling along no faster than 30km per hour. No rush at all. A guy gave us a lift into the main town and then organised 3 mopeds for us - 200 Baht rental per moped. 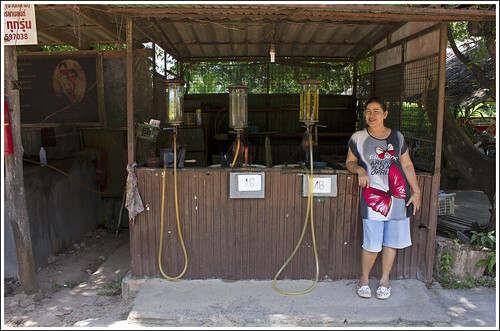 We then stopped to fill them up with gasoline and put some air in the tyres before our ride around the island. I love these bike repair places, always full of junk, nothing gets thrown away! Gasoline on Koh Yao Noi is quite a lot more expensive than the mainland, as everything has to be brought over by boat. We'd not made a really early start to the day, got the boat over around 10:30am, so by the time we'd sorted out the mopeds, some stomachs were thinking of an early lunch. We knew already of places to eat on the east coast, but did not want to rush over there, and so we just stopped near the main town, which is not much more than a couple of hundred meters of shops and a little market. And a 7-11 of course! 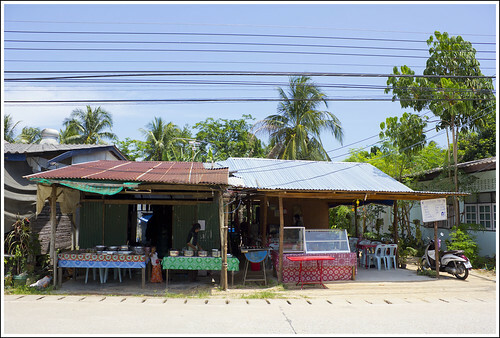 We decided upon a small roadside local restaurant where some locals were already eating - always a good sign. 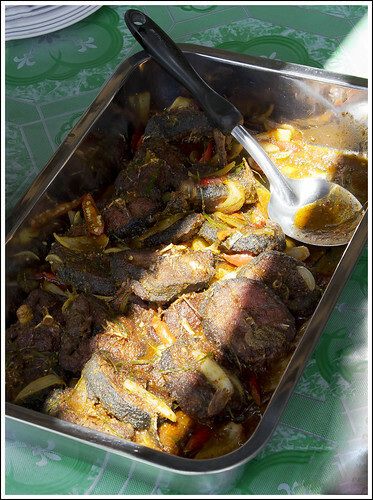 It was certainly nothing fancy, but my eyes noticed some yummy looking Pad Ped Pla (spicy fried catfish). And they did a decent fried rice with prawns to go with it. After lunch we rode over to the east coast. There are not many roads on the island, but we still managed a small wrong turn, following a road to "Laem Sai" which is the southeast corner of Koh Yao Noi, and I figured the road would carry on to the main east coast road. It didn't, but it was only a 10 minute detour. We were soon on the beautiful east coast and stopped to let the kids run around on the beach in front of the very nice looking Villaguna resort, which as I recall was being built last year when we scooted by. There are several small scale resorts on this east coast, but so far nothing big and ugly and I hope the Koh Yao Noi people can keep it that way. As the east coast road heads North, it turns inland for about 2km and then back to the coast, where we found one of my favourite views. 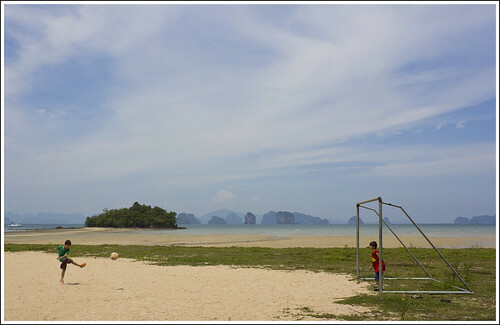 There's a sandy football pitch here just over the road from the small Suntisook Resort, consisting of some little bungalows with an attached restaurant. We downed several cold cokes here - it was a HOT day! The kids of course went off to explore and kick a ball around. My daughter and I were riding a bit ahead of the others and we found some horses by the side of the road. 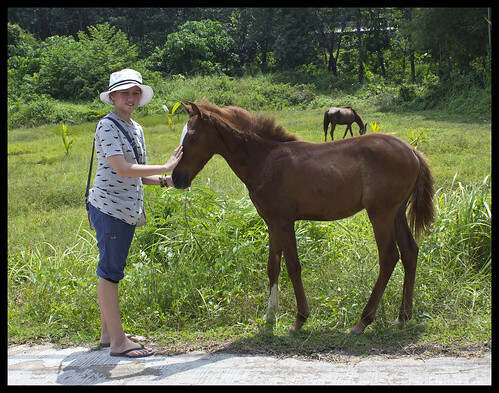 We were able to give this little pony a stroke, but it ran off to Mum when the other 2 bikes arrived - too many people! The scenery away from the beach is very green, but largely cultivated. We saw rice paddies, rubber plantations and coconut trees. 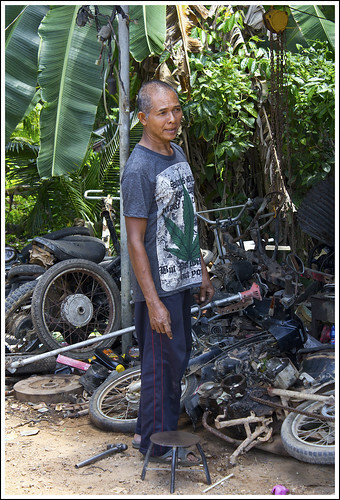 Rubber is still an important product in south Thailand. 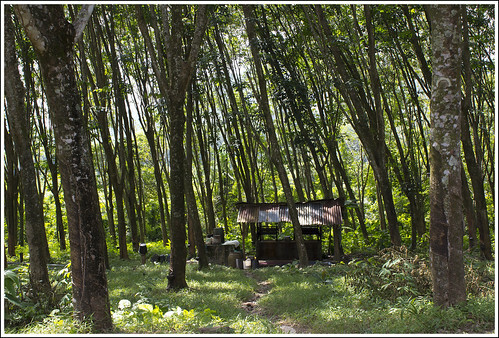 Even in "touristy" Phuket there are huge areas of rubber trees. Indeed, Thailand is one of the world's leading producers of natural rubber. 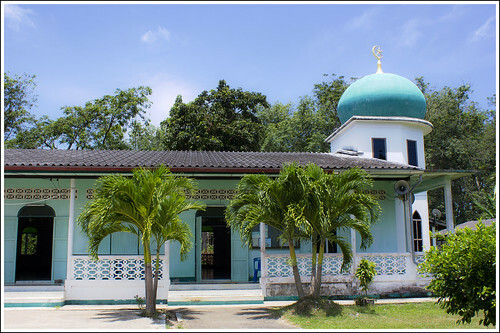 And here's a small mosque on Koh Yao Noi. 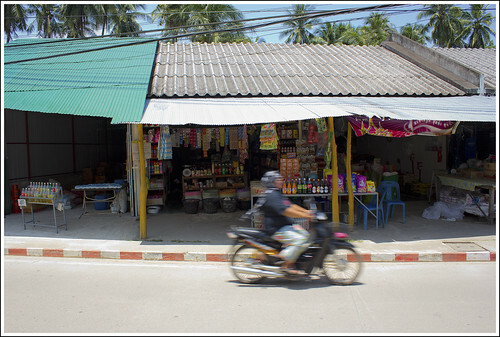 The population is almost all Muslim, as is much of Phang Nga, and about 30% of the population of Phuket too. And actually not that slow. Took a bit more than 1 hour to get from Koh Yao Noi back to Bang Rong, and it's a 25km trip. There were only a few other passengers so we could spread out and enjoy the ride and the views in the afternoon sun. The little video below shows the view just after we left the jetty at Koh Yao Yai heading back to Phuket. A great day out for the family, and we'll do it again for sure! Next time maybe an overnight stay. Here's a little video shot on the boat after leaving the Koh Yao Noi jetty on the way back.